I’ve been using a bottle of Punt E Mes as my go-to sweet vermouth for a good while now. I’m a big fan of the bitter note it brings to drinks, but I’ve been predominantly using it as a generic sweet vermouth which has slightly warped my expectations of certain drinks at the bitter end of the scale. Case in point: the Negroni. When I have one in a bar, I can notice the absence of the extra bitterness provided by the Punt E Mes and it takes me an instant to remember that it’s my Negronis that are slightly out of whack, not the one I’ve just bought. But then it also occurs to me that bitter is a very divisive flavor, and that if I can up the bitter content of a Negroni, surely it’s possible to mellow it out a little. Give the mint leaves a quick smack to wake them up and place them in the base of a mixing glass. Add the gin and vermouth and stir with ice. Strain into an ice-filled old-fashioned glass. Spray some Campari over the top and garnish with an orange zest and a mint sprig. 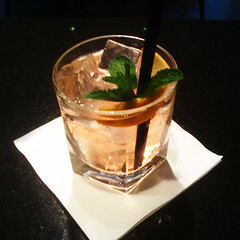 This entry was posted on	June 21, 2009 at 9:54 pm	and is filed under Fiftytwo, Mixology, Projects, Recipes. METHOD Build ingredients, over ice, in a rocks glass and stir. Garnish with an orange wedge.